The mission with the Butter Chain Keeper is to enhance your experience when it comes to cleaning or storing your bike by refining a pro mechanic staple into an elegant and highly functional accessory. We’ve taken a utilitarian tool and made it better in materials, feel, weight, and overall awesomeness. The design of the Butter Chain Keeper performs solidly and its outstanding build quality ensures that it will not wear out or break. 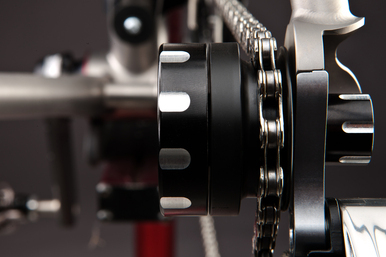 Machined from top-shelf materials such as billet aluminum, Delrin, and stainless steel, this chain keeper is virtually bomb-proof. The Butter Chain Keeper is American-made and hand assembled in Boulder, Colorado. 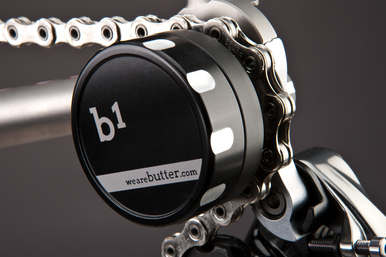 The Butter B1 is for bikes with quick release dropouts. The Butter B2 is for 12 or 15mm thru-axle dropouts.